For each issue of the magazine (going back to issue 7), we will add activities and a themed listening list to the ACTIVITIES tab—you’ll find the tab at the top of the blog. 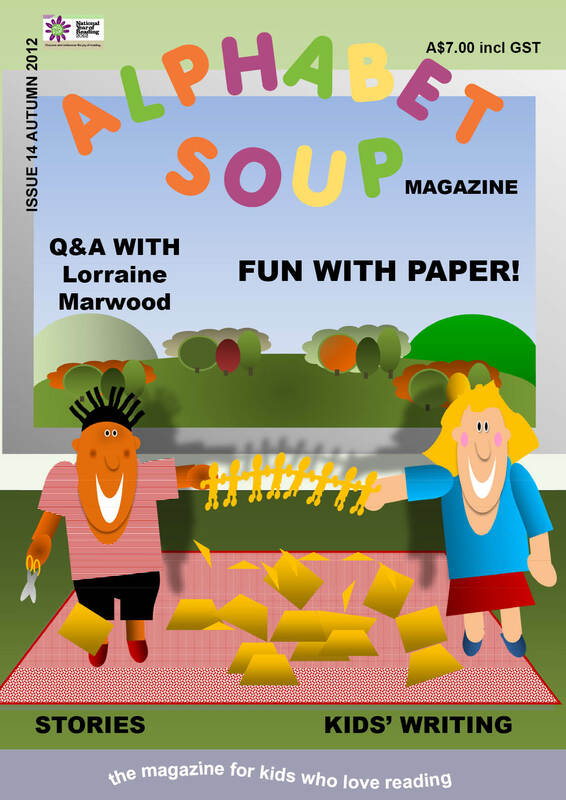 The theme for this issue is PAPER. Enjoy! 1. DECORATE a greeting card using mosaics in paper. Cut the coloured paper, magazine pages and newspaper pages into little pieces. Sort them into piles of similar colours. Draw a simple picture on your blank card. Then glue on the little pieces of paper to ‘colour in’ the picture. Overlapping pieces is OK. Or you might like to leave a tiny white border around each piece you glue on, like tiles on a mosaic. When all the coloured paper is glued on, paint a thin layer of glue over the pieces, to seal it. Set it aside to dry. Now you have a home-made card for the next friend or family member with a birthday! 2. MAKE PAPER DOLL CHAINS (or gingerbread men chains). Make paper doll chains (or gingerbread men chains): You could use your paper doll chains to decorate a card or wrapped present, or you could swap chains with a friend. If you’ve never made paper doll chains before, check out this website for some instructions. This is a very old game and a fun way of deciding something like who will have the first turn on the trampoline today. You need two people to play. The players sit opposite each other and hold their hands closed (make a fist). Together they count ‘one, two, three’ and then each extends a hand in front of the other player, showing a rock, paper, or scissors shape. 4. PENCIL & PAPER GAMES. You probably already know about Noughts and Crosses. But there are HEAPS of other games you can play with only a pencil and paper. Check out this website for instructions—the next time you’re waiting for your sister to finish hockey training or your brother to finish band practise, grab a pencil (and another player) and the time will fly! 5. WRITE a letter to someone far away. Then post it. Everyone loves to get a letter in the mail, and they might even write back to you. 6. ENTER our Autumn writing competition. All you have to do is come up with a fabulous newspaper headline! Find all the details on how to enter here. The Lost Art Of Letter Writing is a four-movement concerto for violin and orchestra written by the Australian composer Brett Dean. Each movement in the concerto begins with an excerpt from a 19th-century letter, with a violin evoking the mood of each letter as it plays the alternate roles of writer and recipient. Authors of the letters include composers Jonahes Brahms and Hugo Wolf, artist Vincent Van Gogh and outlaw Ned Kelly. Hear a really short extract of the music here. You can also download a sample page of the score from the same website. Origami is the name of a ballet written by the Australian composer David Chisolm. It was choreographed by Philip Adams and first performed by the dance group BalletLab and the musicians of the Silo String Quartet in Melbourne in 2006. You can view a short excerpt of the performance (and hear the music!) on BalletLab’s website. The structure of the music is built as if opening one giant fold, like a reverse origami, flattening out the memory of the paper, not to erase it, but to create a place from whence it is possible to begin again. Duo Diorama is the name of the music duo comprising Chinese violinist MingHuan Xu and her husband, Canadian pianist Winston Choi. They have named themselves after the Diorama, as it captures their artistic ideals. You can listen to them play on their website. In the 19th-century Paris, the Diorama was a popular theatre entertainment. It comprised marvelous landscape scenes—with one depicting a mythic event—painted on to linen and brought to life using dramatic effects. These included Diorama lighting—sunlight redirected by a series of mirrors. Such was the skill of the virtuoso light artists, that the diorama’s scenes would appear to take on dimensions and motion—to come alive. See the activities and the themed listening list for issue 9 (summer 2010). See the activities and the themed listening list for issue 8 (spring 2010).